The pictured 1980s certificate is for a spelunking trip into Kentucky's Carter Caves, and I have also visited some of the world's greatest cave systems, including Mammoth Cave and Carlsbad Caverns (the latter shown here in a photo by Vaughn Rees). 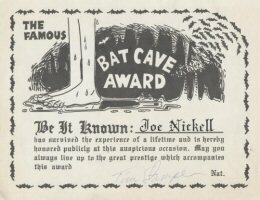 Especially during my latter college years, I went on many caving expeditions (wearing the standard hardhat with carbide lamp attached), notably into wild (non-commercial)caves like Sloan's Valley Cavern and Blowing Cave (both in Southern Kentucky). A flash flood in the latter once caused us to scramble out urgently -- one of my "close calls" in life. Unfortunately, I have no photos of this important period.